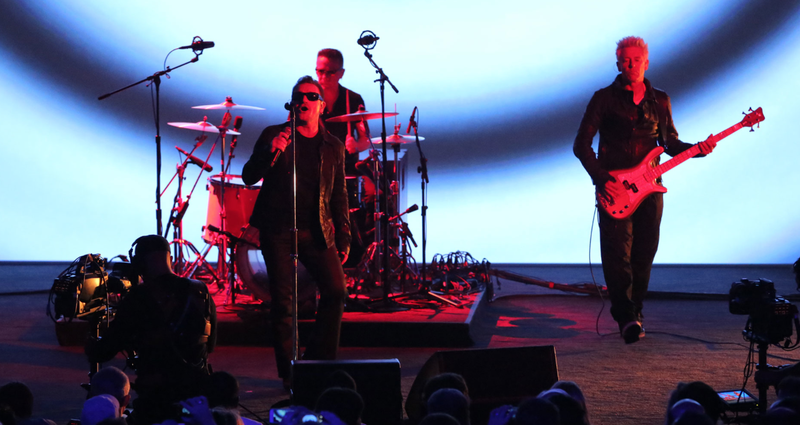 At the end of yesterday’s time-warping, genre-defying, multilingual livestream of the Apple iPhone 6 and Apple Watch announcement, the computer company decided to give a little-known Irish band the spotlight, allowing the lads from U2 to play some tunes for the crowd while simultaneously releasing their new album as a free iTunes download. But there is some bad news for these upstart rockers — they won’t be seeing their band’s name on the Billboard best-selling album chart. This happened last year when a scrappy young hip-hop artist by the name of Jay-Z managed to convince Samsung to give away his Magna Carta… Holy Grail album for free to users of its devices. The boys of U2 — who have silly names like Adam Clayon and Larry Mullen Jr. — won’t be able to show their family how popular they’re becoming and how they can finally quit their jobs at Tesco until after the album goes on sale to paying customers on Oct. 14. There is some hope for notoriety for this foursome from Dublin, as the first single from the album, “The Miracle (of Joey Ramone)” could show up on Billboard’s radio airplay charts. So until then, keep your head up Bono and fellas. We have a feeling that greatness awaits for you yet.